Curiosity is a set of scientific instruments mounted on a robot much like a car. It is currently located in the Gale crater on the surface of Mars. Curiosity has been on the red planet for seven years now, looking for signs of life or the potential for it. This mission has not always gone smoothly for NASA, who sent Curiosity to the crater in 2011. It has faced some technical issues and has not been able to send vital data back to the space science organization. However, Curiosity's latest problem is probably the most severe. The computer that controls the car-sized rover and allows it to perform has apparently failed. Fortunately, it has a backup for this essential component. The NASA scientists realized that Curiosity’s electronic 'mind' was starting to dysfunction when the rover started to lapse in sending back its daily reports from Mars. In cases when these reports were, in fact, being sent, they were incomplete, as though data was not being sent. However, the agency anticipated this problem. Curiosity, like many probes and rovers in the past, was launched with two computers onboard. The primary one, in use from the time it becomes active, is called Side A. In case it fails, the backup, Side B, comes online and takes over. NASA reported that the Side B on Curiosity did so since Side A was confirmed as "down" on September 15, 2018. Furthermore, Side A has been offline before. In 2011, scientists at NASA’s Jet Propulsion Laboratory (JPL) found that the computer was unresponsive, rendering them incapable of controlling or contacting Curiosity. This failure was reported as a set of issues at both the hardware and software level. Side B was also activated at this point while JPL diagnosed and repaired Side A manually. This involved segregating some of the primary computer’s corrupted memory so that it did not affect the rest of its functions. Fortunately, JPL got Curiosity up and running again as a whole, and continued on its mission, which is, essentially, to find life on Mars. Alternatively, the robotic rover is engaged in the search for data that may indicate the potential to support life on the planet in the past or the future. This involves sending data back from a host of chemical, geological, spectrological and other sensors found on Curiosity. These instruments have already sent back some promising information. For example, it reported an unusual methane ‘spike’ near its resting spot of the time in the crater. This occurred on Martian day 200 of its mission in 2013. NASA instructed the rover to drill an experimental bore into the rock at a designated site called Cumberland. The resulting samples were analyzed using the rover’s onboard laboratory, SAM. This data may indicate the presence of organic molecules on Mars, which may be important evidence of the building blocks for life on the planet. But, on the other hand, the perchlorate molecules found in the sample made the absolute confirmation of organic substances that much more difficult. This study also found water molecules in samples taken from Cumberland. However, these molecules were reported to contain deuterium or the ‘heavier’ version of the hydrogen atom. Therefore, this water was not similar to the abundant, life-giving liquid as on Earth. NASA has proposed that this is because the ‘lighter’ hydrogen was more vulnerable to dispersion into the atmosphere compared to deuterium. 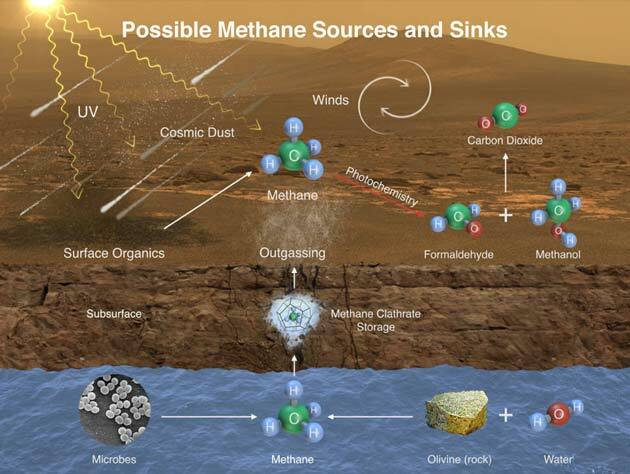 Furthermore, there are a number of good explanations for the methanogenic spike that started this whole protocol besides Martian life. They include pre-existing, biologically inert organic precursors, which may or may not have split into methane as a result of UV exposure. Alternatively, the Martian winds may have blown the methane into the crater from another part of the planet, or its atmosphere. In addition, a type of rock found on Mars, known as olivine, may be capable of releasing methane on reacting with water. Nevertheless, it is also possible that bacteria on the planet, much like the methanogens on Earth, contributed at least some of the gas as waste products. Then again, Curiosity is yet to report any data that suggests more direct evidence of bacterial life on the planet. 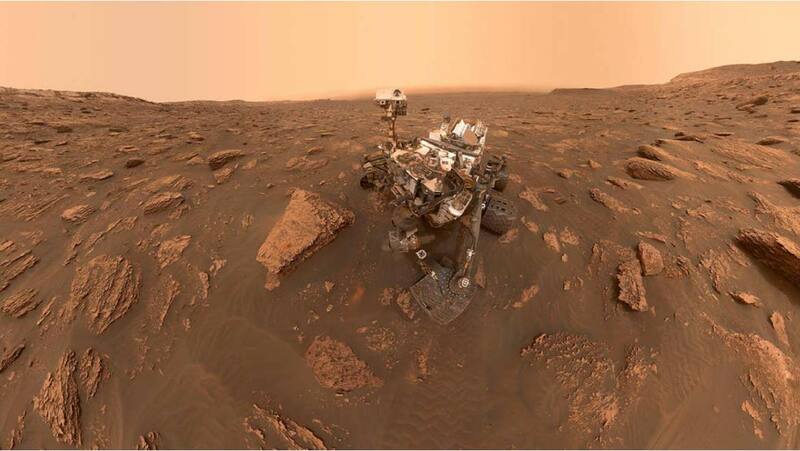 But it must be said that the rover has found evidence of many more elements that could support life on Mars, some of which include carbon, phosphorus, sulfur, oxygen, and nitrogen. Curiosity, in conjunction with another rover, Opportunity, has also sent back images that may suggest evidence of the remains of a body of water (or fluid, at least a stream of it) shortly after landing on the crater. Therefore, water may once have flowed freely on Mars’ surface. However, we also know that the only water now found on Mars exists as rather diffuse vapor that is trapped under the surface in matrices of dust and other compounds. The prevailing theory is that the vast majority of water evaporated away over time, far back in Martian history. Nevertheless, Curiosity will presumably go on looking for further factors that could support life in its current environs. It is just that it will be doing it with half a brain for a short while to come!